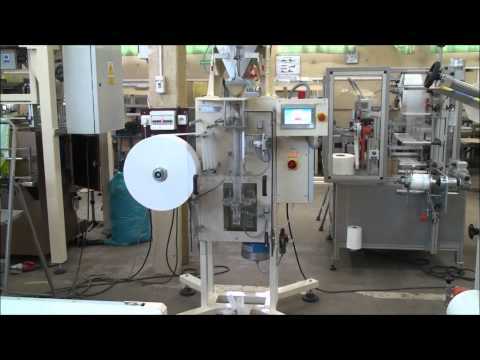 APO-11 Semi- automatic packing machine of teas into tea-jack. 4 load cell-weighing system. For packing powder or grain it is possible to equip with volumetric or crew feeder. The semi-automatic packing machine APO-11 is designed for packing tea into tea-Jack bags performed from the heat sealed filter paper with gussets on each side. The principle of operating is trans-wrap system. This machine one can use for packing spices, powder and grain products. - easy demounting for cleaning. All components of machine APO-11 is placed on self-supporting steel frame covered by protections. All machine elements having direct contact with packed product are made of materials approved by the State Institute of Hygiene (PZH). This machine is equipped with heat sealing jaws and cutting system, and variable adjustment of speed. - the main drive with the possibility of the speed regulation. - the batcher - 4 load cell-weighing system or volumetric dosing. The dimension of bag is relative to customer requirements. the change of width needs the change of forming system.